FRISCO, Texas, Aug. 21, 2018 /PRNewswire/ -- Jamba, Inc. (Nasdaq: JMBA) is celebrating back-to-school season with the official grand opening of its newest location in Phoenix, AZ. The store, located at 3350 N. 7th Ave, #100, is operated by Whirld Concepts, Inc., which currently owns dozens of locations across Arizona. 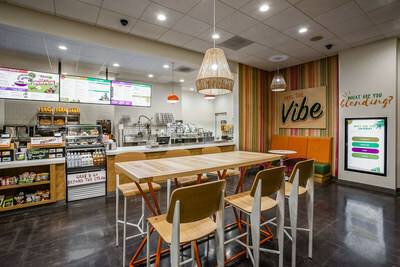 "Our newest Jamba location will provide the Phoenix area with increased access to healthful and naturally energizing options filled with whole food ingredients," said Panos Joulios, President of Whirld Concepts, Inc. "We're also very excited about giving back to the community through our fundraising efforts and partnerships with local schools and organizations." To celebrate the big day, Jamba will host a grand opening event at the new store on Saturday, August 25th from 9:00 – 11:00 a.m. Attendees can taste free samples, snap pictures at the Jamba photobooth, and try their luck at the prize wheel. The store will also honor the back-to-school season by donating 20 percent of the day's sales to Encanto Elementary. Hours of operation for the new location are Monday through Friday, 6:30 a.m. to 9:00 p.m., Saturday 7:00 a.m. to 9:00 p.m., and Sunday 8:00 a.m. to 8:00 p.m.
"At Encanto Elementary, we always encourage our children to choose healthy options, and are so thankful for the wholesome alternatives that Jamba continually provides within the Phoenix community," said Felipe Carranza, Principal at Encanto Elementary. "Through the grand opening donation to Encanto Elementary, we will be able to provide better tools to enhance another important part of a child's healthy upbringing – their education." For more information about Jamba Juice, visit http://www.jambajuice.com. Encanto provides an environment in which children can feel safe, learn and grow academically, socially, and emotionally. Encanto is a community of learners who value, respect and celebrate the differences and the diversity of those around them. The school's focus is on Early Childhood Education helping children strive to meet their highest potential.